Bathymetric, or depth data collected about oceans and other water bodies are typically displayed in one of two ways – as a bathymetric chart, or as a depth raster. 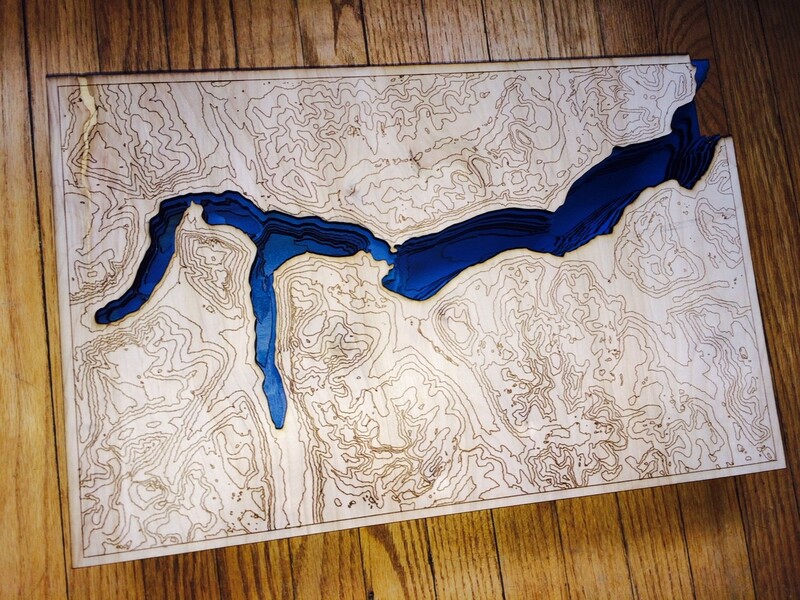 New technologies such as 3D printers and laser cutters allow for the better communication of depth data. 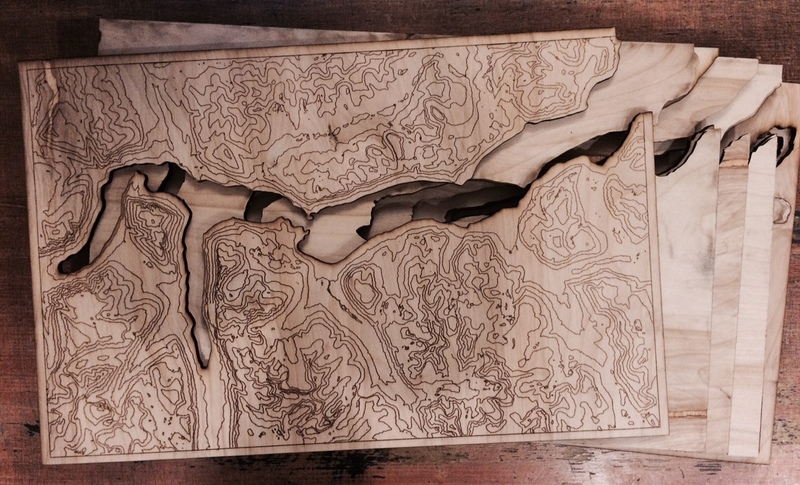 Laser cutters in particular allow for “etching,” which can simultaneously communicate topographic data. This allows the viewer to better situate themselves in the landscape. Examples of this can be seen here and here. A fjord is a coastal feature formed by glaciers. Typically, they contain steep vertical sidewalls, and deep basins separated by shallow sills (ridges of bedrock which rise to depths of less than 50 m). Mapping Nachvak Fjord in 3D, located in the Torngat Mountains in Labrador, will help to better illustrate the unique bathymetric features. 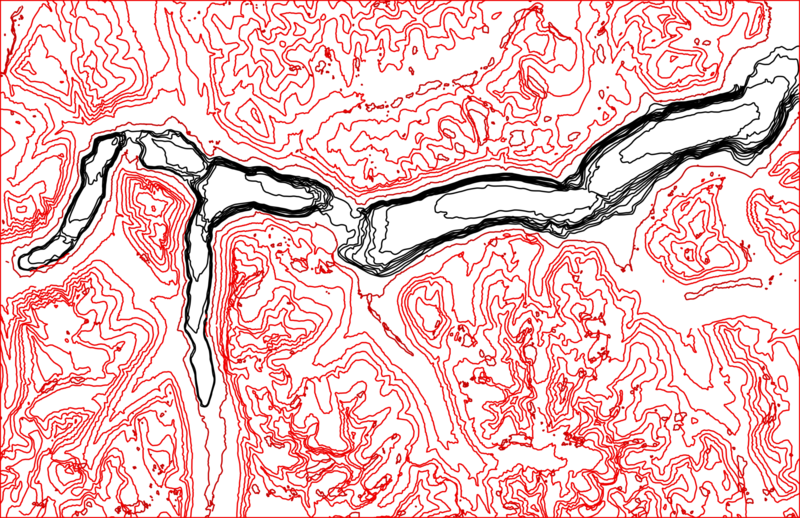 Collection and processing of bathymetric data into useable raster format. Importation of the raster data into GIS software. 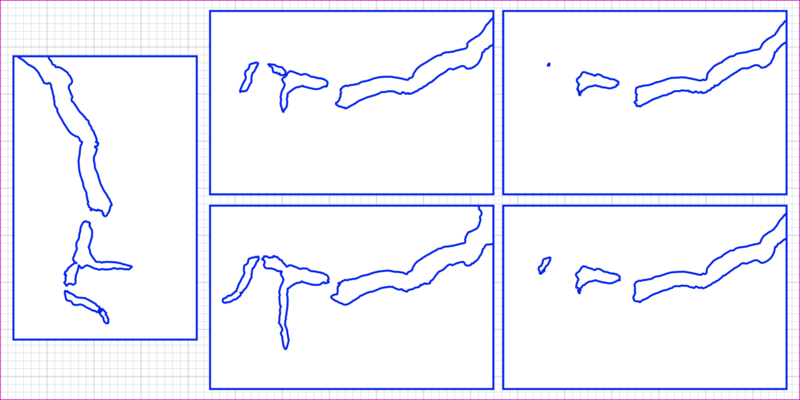 The creation and export of contour data as vector files to secondary graphics. Different colours in the vector file are used to differentiate between etching and cutting. The screenshots below show the bathymetric data collected between 2003 and 2009 by the Canadian Hydrographic Service and ArcticNet. The data are available for free for download from the Ocean Mapping Group website. The spatial resolution of the data is 5×5 m with a vertical accuracy of 1 m. The data ranges in depth from 211 m to 1 m. Contours were created at 20 m intervals, smoothed and exported as vector files. The data used for etching the topographic map on the top layer are a product called CanVec, which is downloadable for free from Geogratis. The contour interval was reduced to 200 m to improve visibility. Extraneous shapefiles such as points were removed. The data were manipulated in iDraw (a Mac-based vector graphics program) to smooth out overlapping lines and crop to an appropriate area as shown in the following screenshot. The laser printer has a 2 x 4 foot printing bed. In order to save materials and cutting time, layers need to be nested in the bed space, colour coded for cutting and etching, and exported as either a PDF or SVG. Each contour makes up a layer – with a solid rectangle for the base, and the topographic information etched into the top layer. 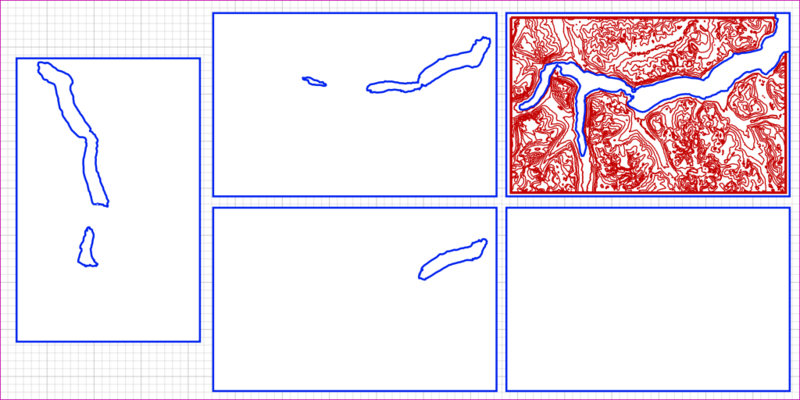 The following screenshot shows two cutting surfaces, each with 5 map layers. The laser cutting was done at the Danforth Tool Library (http://torontotoollibrary.com), out of 1/4 inch Birch Plywood. They were cleaned (the cutting produces soot), stained, and glued together with carpenter glue. Initial plans included the use of etching to detail habitat and substrate information. Time and finanical constraints limited the amount of etching work that could be done. Additionally, if the project were repeated it could be worth either using thinner materials, or increasing the contour interval. The slope on the side walls is so steep, and the fiord so narrow that the fine details are hard to see in the final version.